The canicool cooling vest for dogs is unique! The dog's fur gets warm in summer, in the sun up to 60 degrees, the cooling vest prevents this by its cooling down up to 15° Celsius compared to the ambient temperature (The body temperature of the dog is not affected). Optimum freedom of movement: The design of the vest allows the dog to move absolutely freely and naturally. 100% dry! No wet dog fur: Only works with water, but stays dry inside and outside. Durable: Cools up to 3 days non-stop, can be reactivated over 750 (=approx. 54'000 hours, a dog's life long). Developed with veterinarians: Veterinarians know that heat puts a lot of strain on a dog's organism. This knowledge is reflected in the cani.cool cooling vest. Heat stress will be reduced significant. Light and no annoying belts or buckles. Most powerful cooling technology on the market. Our cooling vest adapts very well to the body shape of the dog by using a new 3D-stretch material. 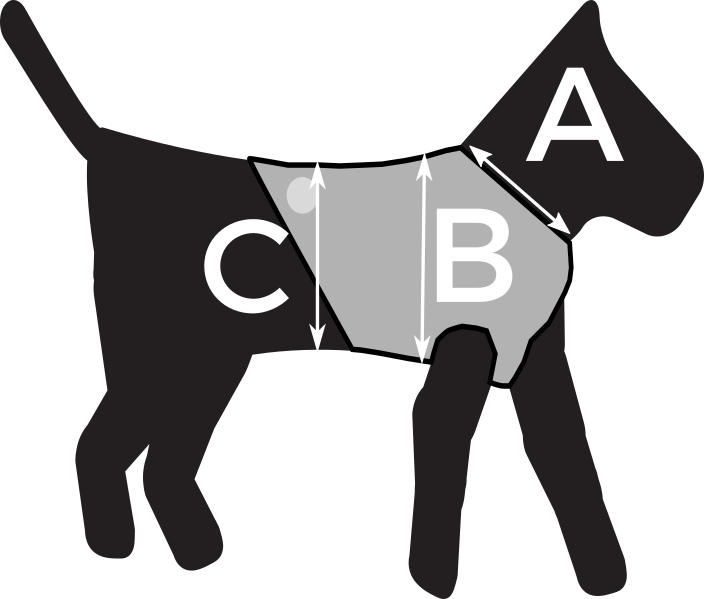 The most important size is the chest circumference (B). Since the evaporation cooling depends to a certain extent on the air flow of the environment, it is better to use a larger vest (depending on the breed). If you are unsure, call us and we will be happy to help you (0041 33 511 11 77)! Dogs feel most comfortable when the outside temperature is below 20 degrees Celsius. The dogs nose is the actual cooling unit of the dog. Like our vest, this works according to the evaporation principle and lies behind the olfactory organ. Especially with short-nosed breeds (pug, French bulldog etc.) this is too small and these breeds suffer particularly from the summer heat. Panting causes a higher heart rate and therefore an additional strain, especially in older dogs. The cooling capacity of our cooling vest perfectly meets the needs for relaxation in a cooling environment. In cooperation with veterinarians the vest was developed according to the needs of the dog, so that your dog can also enjoy the coolness and feel comfortable on the way. Also older dogs, which already have age-related changes of the cardiopulmonary circulation, can be supported in the warm months by the cooling vest in the best way. The exceptional cooling performance means that the dog is more efficient in warm environments and his circulation is spared. Especially with older dogs, the cooling vest can massively improve their quality of life in summer and reduce the heat-related circulatory stress. No refrigerator, additional gels or chemicals are required. This product works best at low to medium humidity.